To Cite: Rahbar M, Vossoghian S, Alimehr S, Shekari Ebrahim Abad H, Mohammadzadeh M, et al. Prevalence of Candida Infection at the Intensive Care Unit with Nested Polymerase Chain Reaction (PCR) Using Primer Mixes Specific to Candida DNA Topoisomerase II Genes, Arch Clin Infect Dis. 2016 ; 11(4):e36166. doi: 10.5812/archcid.36166. Background: The occurrence of invasive Candida infections has increased during the past two decades as a result of increasing in the number of immunocompromised patients. Objectives: In this study (cross sectional design), during six months, the prevalence patterns of Candida species isolated from sterile body sites of patients admitted to the general hospital of Milad Intensive Care Units (ICUs) in Tehran (Iran), were determined. Methods: Candidal isolates were obtained from 50 patients admitted to Milad ICUs from April to September 2013. Identification of the isolates was performed using morphological and Polymerase Chain Reaction assay. For identification of Candida at the species level, degenerated and specific primers based on the genomic sequences of DNA topoisomerase II of Candida species were used and their specificities tested by PCR-based identifications. Results: A total of 67 Candida isolates were obtained from 50 patients. Out of 67 Candida isolates, 47.8% were C. glabrata, 28.3% were C. albicans, 7.5% were C. tropicalis, 7.5% were C. guilliermondii, 3% were C. krusei and 4.4% were C. dubliniensis. The main patient group affected by candidal infections was aged 50 to 70 years. Overall, 11.7% of patients had cancer while other diseases such as diabetes were less reported. The mean time of stay at the ICU before identification was 25.3 days (ranging from 2 to 120 days). Conclusions: Increase in the prevalence of non-C. albicans species in the recent years has become a problematic event amongst clinicians caring for ICU patients. Candida glabrata is the most common species isolated from ICU patients in comparison with other species in this study. These findings emphasized on the significance of organizing treatable prevention programs. Previous studies have shown that Candida species are the most frequent opportunistic fungi leading to IFI among Intensive Care Unit (ICU) patients. These species have variations in their distribution and also differences in their susceptibility to antifungal drugs (1-3). Quick and low-cost identification of Candida at the species level is important for clinical management of candidemia. As compared to conventional culture-based methods, molecular tests are not yet available and standardized in most laboratories to reduce the time required for species identification (4). In immunocompromised individuals, several species of Candida lead to opportunistic fungal infections. During the recent years, the infection prevalence caused by C. albicans has dropped compared to those by other species. This indicates reduced susceptibility to fluconazole, as an antifungal agent. Recent studies of nosocomial Candida infections, according to the epidemiologic importance of this phenomenon, have increased (5). Candida species other than C. albicans include Candida glabrata, Candida tropicalis, Candida parapsilosis, C. lusitaniae and Candida krusei, all can lead to IFI occurrence. Recently, there has been an epidemiological shift to non-albicans species, which is generally prevailed in immunocompromised patients (6, 7). While identification of Candida species can be performed using conventional analysis including morphological, serological and biochemical tests, molecular biology-based techniques specially, diagnostic Polymerase Chain Reaction (PCR) testing, appear to be more rapid and sensitive techniques for the identification of Candida species (8). Due to the increased incidence of human disease caused by less common Candida species, development of these approaches is also necessary for quick and accurate identification of these disease-causing yeasts (8, 9). In this study the frequency of Candida species causing IFI was determined by using the PCR assay. Polymerase Chain Reaction amplification was carried out on the Candida strains isolated from patients admitted to Milad Hospital ICU settings during a six-month study period. According to the frequent emergence of Candida species among ICU patients over the last few years, it is necessary to determine the prevalence of Candida infection to utilize a rapid and sensitive identification for obtaining effective antifungal therapy to control nosocomial infections. Because of the changing epidemiology of fungal infections over time, it is important to verify the incidence of key Candida species every decade for an update on epidemiology (10, 11). Candida species isolated from sterile sites of a total of 50 patients (31% male and 69% female) were obtained from 561 patients admitted to Milad hospital ICU settings. Milad hospital is a 1000-bed tertiary care hospital, affiliated with a social security organization. The study was conducted during the six-month study period from April to September 2013 in the ICU of Milad hospital. A questionnaire was filled for each patient. Accumulated factors of interest included: age, gender, underlying diseases and predisposing factors (such as receipt of broad spectrum antibiotics, immunodeficiency or neutropenia, burns, having recent surgery, hemodialysis, serum injection, existence of a central venous catheter, diabetes mellitus, renal failure, existence of a urine catheter, long term stay at the ICU). All the patients, who used antifungal drugs, were excluded from the sample. Sterile Specimens including blood, cerebrospinal fluid, peritoneal fluid, urine, Foley catheter, tracheal catheter and nasogastric tubes were collected and cultured in Bactec medium. The isolates were sent to the laboratory of Pediatric Infections Research Center (PIRC) for identification and antifungal susceptibility testing. Positive blood culture of Candida species was defined as Candida Bloodstream Infection (BSI) in patients, who had been admitted to the ICU for more than 48 hours. Urinary candidiasis was defined by positive urine culture that had yielded ≥ 103 yeast colonies/milliliter. Candida isolates were stored in sterile distilled water at room temperature and afterwards inoculated onto Sabouraud Dextrose agar (Merck, Germany) for 24 hours at 37°C. The BACTEC 860 system (Becton Dickinson, Sparks, MD) was used for detecting Candida existence in blood specimens. Candida species identification was performed by microscopic morphology analysis on potato dextrose agar (OXOID LTD, Basingstoke, Hampshire, England) and germ tube formation in fetal calf serum at 37°C. Morphological characters were assessed on cornmeal-Tween 80 agar. For species typing of the samples, DNAs from Candida isolates were extracted and purified by employing the glass bead method, as described by Mirhendi et al. (12). Polymerase Chain Reaction was carried out using the PCR premix kit (AccuPower Bioneer Corporation) with a total reaction volume of 20 µL, consisting of 10 mM Tris-HCl (pH 8.3), 30 mM KCl, 1.5 mM MgCl2, 250µ M deoxyribonucleoside triphosphates, 10 pmol primers, and 1 U of Taq DNA polymerase. Polymerase Chain Reaction (eppendorf) was primarily achieved by using the degenerated primer pair and afterwards the PCR products were then amplified by the primer mixes, or species-specific primer pairs as published previously (13). To increase sensitivity in PCR amplification, we pre-amplified sample DNAs by a degenerated primer pair (CDF28/CDR148), then by using the primer mixes followed by the main amplification (13). The PCR conditions were as follows: preheating at 96°C for two minutes, then 30 cycles of denaturation at 96°C for one minute, annealing at 54°C for 30 seconds and extension at 72°C for one minute. Thermal cycles were terminated by extension at 72°C for five minutes. Polymerase Chain Reaction products were analyzed by electrophoresis (bio rad) through a 1.5% agarose gel (Roche/Germany). Gels were stained with ethidium bromide (0.5μg/mL) and visualized by a trans-illuminator and photographed. This study was conducted from April to September 2013 at the ICU of Milad hospital. A total of 67 Candida isolates were obtained from 50 patients (31% mail) out of 561 patients admitted to Milad hospital ICU settings during a six-month period. The clinical data for infectious patients is demonstrated in Table 1. The main patient group affected by candidal infections was aged 50 to 70 years. Furthermore, 11.7% of patients had cancer while other diseases such as diabetes were less reported. The mean time of stay at the ICU before identification was 25.3 days (ranging from 2 to 120 days). Host effective risk factors included blood reception (96%), long term stay at the ICU (more than three days) (94%), use of central venous catheter (88%), serum transfusion (82%), broad spectrum antibiotic therapy (72%), presence of a urine catheter (70%), recent surgery (28%) and severe sepsis (24%). Forty-eight cases were under recent antibiotic therapy, most of which received vancomycin, meropenem and clindamycin. 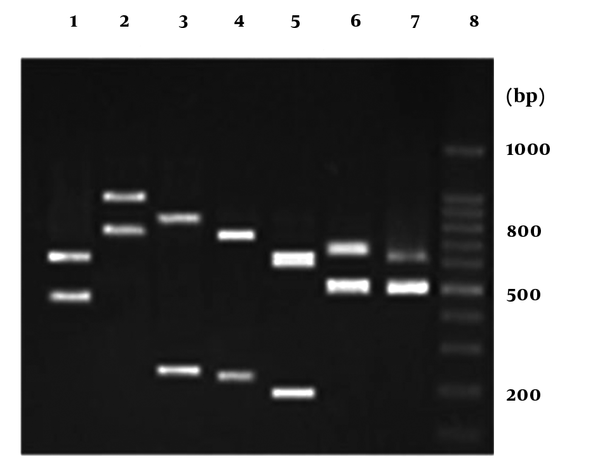 Sixty-seven candidal isolates were detected by determination of morphological characters and their species were distinguished through PCR-based identification (Figure 1). The Candida spp. on the basis of the amplification profiles of DNA derived from candidal isolates were as follows: lane1: C. glabrata, lane 2: C. dubliniensis, lane3: C. tropicalis, lane 4: C. krusei, lane 5: C. guilliermondii, lane 6: C. kefyr, lane 7: C. albicans, lane 8: 100 bp DNA marker. The numbers on the right indicate the sizes (bp) of the molecular marker. Of the 67 candidal isolates, 32 (47.8%) were C. glabrata, 19 (28.3%) were C. albicans, 5 (7.5%) were C. tropicalis and 2 (3%) were C. krusei, and 13.4% were a variety of Candida spp. including C. guilliermondii (5 isolates), C. dubliniensis (3 isolates) and one isolate of C. kefyr (Most Most of Candida species were obtained from urine (59.7%), as well as other normally sterile body sites including blood (16.4%), cerebrospinal fluid (1.5%) and peritoneal fluid (1.5%) or from foreign bodies including Foley catheter (14.9%), tracheal catheter (3.0%) and nasogastric tube (3.0%), (Table 2). Amongst 11 samples isolated from blood, the most frequently found species were C. albicans with five isolates (45.4%), C. glabrata with four isolates (36.4%), and C. dubliniensis and C. tropicalis each with one isolate (9.1%). Forty specimens were isolated from urine of which 19 isolates (47/5%) revealed C. glabrata, nine (22.5%) showed C. albicans, five (12.5%) revealed C. guilliermondii, three (7.5%) contained C. tropicalis, two isolates (5%) showed C. dubliniensis, C. krusei and C. kefyr, each with 2.5% of the isolates. Of the 10 Candida cases obtained from Foley catheter, six isolates (60%) were C. glabrata and four isolates (40%) were C. albicans. Candida albicans and C. glabrata were attained from nasogastric tube, while C. krusei and C. glabrata were attained from tracheal catheter. Candida glabrata and one C. tropicalis isolate were obtained from peritoneal fluid and cerebrospinal fluid, respectively. Mixed infections were detected in specimens from urine (57.1%), blood (21.4%), foley catheter (14.2%) and nasogastric tube (7.1%). Over the last decades, we have had a large increase in IFIs in general, because of the increased amount of endangered population. The most common cause of hospital-acquired infections is Candida species, especially among ICU patients (14). In the current study, surveillance of IFI in ICUs of Milad hospital was performed during a six-month period. The age of most infected patients ranged from 50 to 70 years, similar to the results of a prospective study at ICUs of Italian hospitals (15). The main underlying disease among infected patients was cancer (11.7%), while the results of other studies reported that Human Immunodeficiency Virus (HIV) infection and autoimmune disease were the most general underlying diseases (1, 15). The possible reasons of cancer as the main underlying disease in candidiasis are as follows: mucosal damage due to chemotherapy, consumption of corticosteroids, increased use of broad-spectrum antibiotics and presence of central venous catheter (16). Most candidal isolates were obtained from urine specimens (59.7%) with the rank order of species as follows: C. glabrata > C. albicans> C. guilliermondii > C. tropicalis > C. dubliniensis > C. krusei and C. kefyr, which was different to other studies that reported C. albicans as the most prevalent isolate in patients with urinary candidiasis (22-29). However in another study, urinary candidiasis was found to be more common in the Candida non-albicans group (30). It is remarkable that C. albicans is more susceptible and easier eradicable than other Candida species, which can lead to the proliferation of less susceptible species such as C. glabrata (31, 32). A shift to non-albicans Candida species, mainly C. glabrata among ICU patients increases the level of Candida strains resistance to antifungal agents and can become an important problem for clinicians (33-36). In this study, C. albicans was accounted for 45.4% of BSI, which is in accordance with other studies that reported a prevalence of near 50% for this species in BS (37-40). The most prevalent Candida non-albicans species isolated from blood was C. glabrata (36.4%). This result is in agreement with other studies that documented C. glabrata as the most common Candida non-albicans species that causes BSI (21, 40). However in some studies C. parapsilosis was reported to be the most common cause of BSI (41, 42). The reason for this variable data is indefinite yet it may be due to azole use practices. All in all, widespread use of antifungal agents can direct selective pressure towards preferring less susceptible Candida species and therefore increase in the level of resistance to antifungal agents among Candida isolates (43, 44). This can lead to a new challenge in the management of preventive treatments to avoid development of resistance to the current antifungals. Among Candida species obtained from other specimens (23.9%), C. albicans and C. glabrata were the most prevalent isolates (31.2% and 56.2%, respectively). Higher prevalence of C. glabrata among the miscellaneous specimens (Foley catheter, tracheal catheter, nasogastric tube, cerebrospinal fluid and peritoneal fluid) compared to C. albicans is considerable. Increase in the use of antifungal agents has led to occurrence of further resistance species, especially C. glabrata. However, there are a few published studies regarding the distribution of Candida species in other sterile sites of the body and foreign bodies. Mixed infections were detected in 28% of cases, most of which were isolated from urine specimens (57.1%). This evidence implies that PCR, by using primer mixes, is more accurate than culturing for identification of Candida species in clinical specimens. This study showed a significant increase in the prevalence of non-C. albicans species amongst ICU patients, which has become a problematic intricacy for clinicians in the recent years. The modification in epidemiology emphasizes the necessity to monitor local incidence, species distribution and susceptibility in order to optimize therapy and outcome.